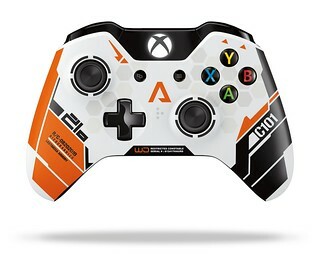 The Xbox One Titanfall Limited Edition Wireless Controller will be available worldwide in time for the launch of Titanfall on March 11, 2014 in North America and beginning March 13, 2014 in Europe for ERP USD $64.99. The controller is currently available for pre-order in the US at the Microsoft Store. Here are some high resoluton images of the controller as well as the packaging. PLUS: I have two controllers to give away. How can you win one of these beauties? Simple: leave a comment below (don’t @ reply me on Twitter) and tell me what are you most looking forward to about Titanfall? The rules: Deadline to enter is 6:00 pm ET on Thursday January 23rd. Two randomly selected winner will be notified by e-mail or Twitter. One entry per person. Winners will receive their prize a few days before Titanfall ships on March 11th. Read this if you have questions about the Disqus commenting system. Contest is open to all regions where Xbox One is available. Note: If you do not have an e-mail address or Twitter name associated with your Disqus login, you must include your Twitter information in your comment to be eligible. Any winner who does not respond to my notification within 72 hours will forfeit the prize. For faster notification, follow me on Twitter where I can DM you if you won. You currently can not add demos to your Xbox One download queue from Xbox.com or SmartGlass. You’ll need to start the download from your console. Update: Comments are closed. Random winners will be chosen, notified and posted soon!